I am very much excited to write this. You always do not need a heavy duty sewing machine to do your basic works. There are some good Handheld Sewing machines are also available to do your basic stiches and hems. Some people feel it easy is easy hand stich rather to buy a big heavy duty sewing machine and spend more money. You may have the questions in your mind…. If you have same questions in your mind, then I have tried to answered in this post. I have listed some best Handheld sewing machines available. But…. Taking into this into consideration, I have prepared a list of Top 13 Handheld Sewing Machines. Which I think will help you little in taking your decission in buying the best Portable Sewing Machine of your choice and to make your basic stiches. This is a portable Handheld Sewing Machine. This is a powerful sewing machine with minimum features and mostly for basic stitches. This Portable Sewing Machine is supplied by OxGord, a trusted brand. It is a portable, cordless battery powered sewing machine. It is perfect for basic repairs and quick patches. Any type of fabrics can be used in it. It can handle denim, silk, cotton, nylon and much more. Its powered by a battery, so you can take to the outside of home also. Its is very much useful for quick repairs like hem pants, repair fabrics, making holes and rips. It is only $14.95. It can useful for quick sewing, quick repairing when you are in a hurry and do not have time to sew it with hand. If you have low space then it is a good choice. Apart from all these plus points, it is unnecessary to think that it can replace the traditional sewing machine in any way. It can be a way better to hand sewing. This is also a good Handheld Sewing Machine with good features. It is made up of plastic, weigh only 250 grams. It is a Flat Bed, Lock Stich type sewing machine. 4 AA batteries needed to run this machine. It is vey good for basic stiches, hems. It is very convenient to take it to anywhere because of its lightweight. You can make handkerchiefs, pillow covers with the help of the amazing portable Handheld Sewing machine. It is very good for students and useful while traveling. You can mend, sew and work on small projects without dragging your bulky sewing machine. It has very good reviews on Amazon. It has may pros and some cons. It is only $14.69. You cant expect much at this cost. You can face some problem in handling this. So to this problem you need to read the manual correctly. It is another good Hand held Sewing Machine from a trusted brand that is Stich Sew Quick from Singer. It is easy to carry, compact and portable. It is very easy to repair. It is like all other handheld sewing machines. It is easy to carry. easy to sew and easy to repair. The pros are many like It is cheap, easy to handle, easy to carry, takes less space and easy to repair. The cons are it cant handle heavy load. It is not easy to sew denims with this sewing machine. If you will not read the manual perfectly then it can be difficult to handle this. You cant expect $100 work by just spending $20. You can do all your basic stitches under $20. This another low cost cordless and totally portable Handheld Sewing Machine. This costs only $9.99. It can mend, hem and sew. You can make your pillow cover, handkerchief any type of repair. What more can you expect from a just $10 sewing machine. If you are a professional tailor, then this product is not for you. This is suitable for working moms, students, hostel staying students and those who have less space in their home. It can fit in a small bag even in a purse. This is the cheapest Handheld Sewing Machine I thinks. Look at the price it is just under $10. It is a small and low weight sewing machine. You can take it to your college, parties and functions. It can be a handy equipment in your need. It can handle all the basic stiches, hems, mends and repair. The machine can perform well above its size. If you know how to handle this. It is a cordless, poratble sewing machine and powered by 4 AA batteries. It has many pros and some cons also, like it sometimes stopped working. But the machine is good if you understand everything from the manual. This Handheld sewing machine has some advanced features. It has two power supply modes. It is both handheld and desktop used and very easy to use. It is Mini 2-speed sewing machine offers double thread and perfect stitch control. It can handle anything from silk to denim. It has both hand switch and foot pedal to start. 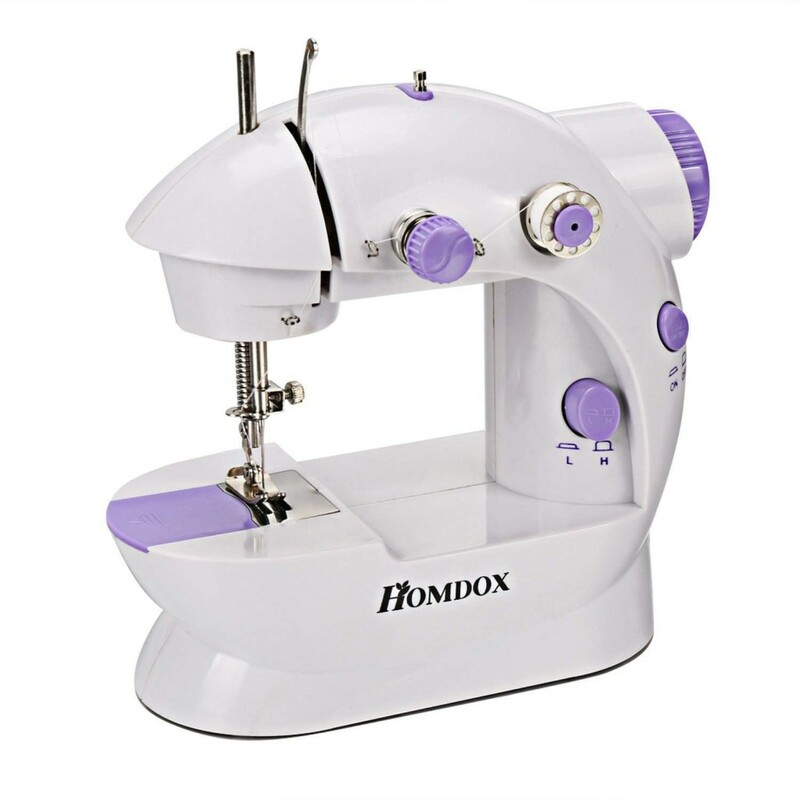 It has Top drop-in bobbin ensures easy threading; automatic thread rewind. It Includes 4 bobbins, a foot pedal, needle, and threader. It is light weight,portable and convenient in daily life. This cute little Sewing machine costs $24. It is good to invest. It is powered by 4 AA batteries or DC/AC adapter. This machine has many positive points to tell so as some negative points also. This machine is not suitable for sewing loop cloth, sweater, flexible knitted cloth, underclothes and drawers. But it can handle all other basic stitches. It will occupy very less space. This another sewing machine with similar features as abve product. It is only $19.95. It is a Cord/Cordless Sewing Machine-Mini Rex Sew is expert sewing in express time. It can Sew with ease all kinds of fabrics like silk, denim, leather, crafts and paper. The handle of the Sewing Machine has been conveniently designed so you can easily carry it to sew, mend or repair all around the house. This mini sewing machine features: pre-threaded and ready to use; double stitch; uses standard thread; press release on/off; four metal bobbins with thread; two speeds-high/low; three needles; one threader and one spindle. It runs on four AA batteries or an A/C Adapter. It is compact and lightweight design makes it great for travel. This is a high quality handheld as well as Desktop sewing machine. It is powered by both batteries and adaptor. It is a light weight, compact and easy to use sewing machine. It is a very good sewing machine and worth to invest. It is only $50. It is ideal for working moms, students and hostel students. It occupies less space and useful for all type of basic stithes. For better operation you have to read the instruction manual carefully. It has two switching speeds. It can mend, sew and repair in very less time. It is a product from Homdox. It is both handheld and desktop sewing machine. It is just $22.98. It is a chain stitch sewing machine. It performs chain stitch. It can perform both forward and reverse stitch. It has double thread and double speed. It has automate thread rewind and tacks button. It also has in built sewing light. It is an excellent handheld sewing machine. It can sew all types of fabrics from denims to silk. It can be a perfect replacement of your bulky sewing machine. If you are a professional craftsman then this is not for you. But it is one of the best handheld sewing machine which can handle every type of sewing. It is more than for its price. It is a high quality handheld sewing machine with a price of only $22.95. This JIAYI-202 is a mini sewing machine. It is featured by double thread, double speed and automatic thread rewind. It is both handheld and desktop sewing machine. You can use hand switch or foot pedal to start. This mini Sew Machine can stitch on any fabric from delicate silks to denims. It has a top drop-in bobbin.This Sewing Machine makes threading the needle seem like a cake walk. The Sewing Machine also has an automatic thread rewind feature and a simple on/off control button which saves your time and energy. But sometimes the bobbin case may become loose and move freely within the throat of the machine, or it may pop out. This can be remedied by re-aligning the bobbin. The repositioning of the bobbin can be done by hand by turning it and gently shaking back and forth. If the bobbin is stuck and you are not able to turn it or reposition it by hand, a screwdriver can be used gently to lift it in order to reposition correctly and place the black knob to the left side of the white plastic edge. Please be careful to gently lift the plastic edge with the screwdriver, applying too much pressure can make the plastic edge break. It is an excellent sewing machine at this price. It is a must try. Finally you have landed here!!! This is the end of this article. I have tried my best to list some best Handheld Portable Sewing Machines with good features and affordable price. I hope you must come to the conclusion which product to buy. You can share it with your friends on social networking sites like facebook, twitter and google plus. Thanks for having patience and reading this post. Really appreciate this article.very useful for new user.Liked the singer option.Its the trusted and named product so the warranty is valid. Also it can be easily placed it a very compact space. Very useful for travelling purpose.Very useful to repair our daily chores. Must give it a try. sir, i am dema gawas one month ago i brought one sewing machine whose name is divinext handy stitch manual sewing machine . The machine is quiet good but the problem is it is not sewing the clothes and we are facing this problem so please guide us or help us to solve this problem we need your help so please kindly reply to our message. I am extremely sorry for your inconvenience. What type of problem you are facing in sewing the clothes. Hand held sewing machines are not good for professional use. It is only suitable for personal use. I need to sew a new zipper in a motorcycle pop up camper, and can’t really remove the canvas. Which one of these would you recommend? Most of these handheld ‘machines’ are literally a piece of junk. I don’t know how they even sell. You can give all the pros in the world, at the end of the day, the cons outweigh the pros every single time. Again, they are all pieces of junk. Thank you! I’m looking at getting one of them as gift to someone. She admires sewing works, but don’t know how to; in fact never sewn before. She’s totally a novice. Please may I know the best machine she can start with in order to learn and practice. You can check this http://thefinestthread.com/best-sewing-machines-under-100-dollar/. These are absolutely for beginners. Nice piece of information. I appreciate you. Thank you. Hi thanks for this info but still don’t know which is right. Want to move dog bone decal on a dog bed. Making bed smaller.